a. The machine gun must fire up and over the hill. Its fire must be observed and adjusted by a crewmember that can observe the target from a position on a flank or to the rear of the weapon (on higher ground). A defilade position allows little opportunity to engage new targets. The tripod mount is used when firing from defilade, because the gunner can measure vertical angles with it. This makes changes in elevation for adjusting fire easier, and if data is determined during daylight, the crew can fire from the same position after dark. A machine gun is in partial defilade when it is positioned just back of the crest of a hill, so that the crest provides some protection from enemy direct-fire and the machine guns are still able to engage its target by direct-lay techniques. • The crew has cover and concealment from enemy direct-fire weapons. • The crew has some freedom of movement near the position. • Control and supply are easier. • The smoke and flash of the machine gun are hidden from the enemy. • Rapidly moving ground targets are hard to engage, because adjustment of fire must be made by using an observer. • Targets close to the mask usually cannot be engaged. • Final protective line is hard to understand. b. 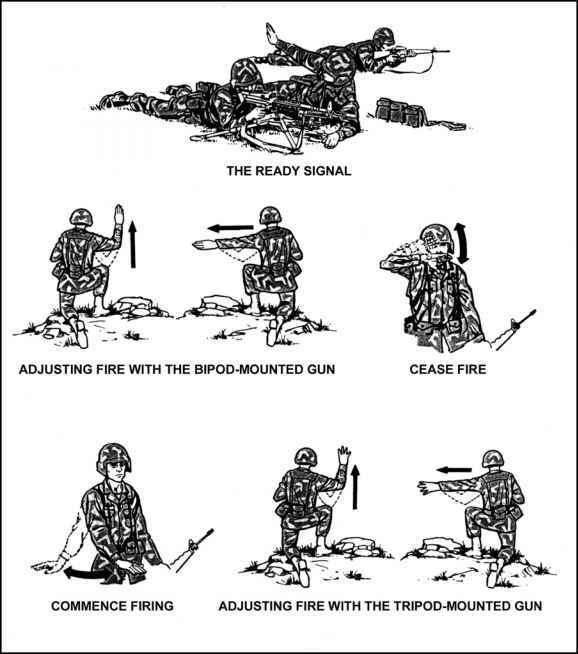 The essential elements in the engagement of a target from a defilade position are mask clearance, direction, and adjustment of fire. If possible, a minimum mask clearance (minimum elevation) is determined for the entire sector of fire, however, a mask clearance for each target may be necessary (due to the slope of the mask). The elevation readings obtained using the methods below give the minimum elevation for the sector or target(s). The minimum elevation should be recorded on a range card. (1) If the mask is 300 meters or less from the machine gun position, the gunner places a 300-meter range setting on the rear sight, aims on the top of the mask and adds 3 mils (clicks) of elevation with the elevating handwheel. (2) If the mask is over 300 meters from the machine gun position, the gunner places the range setting to the mask on the rear sight, aims on the top of the mask, and adds 3 mils (clicks) of elevation. Figure 5-20. Observer adjusting fire. (1) If the aiming point is on the gun-to-target line, the gun is laid on the aiming point and is thereby aligned for direction. (2) If the aiming point is not on the gun-to-target line, the horizontal distance in mils is determined using the best means available (usually binoculars) and announced to the gunner. This measured distance is then set with the traversing handwheel. d. The observer measures the vertical distance from the aiming point to the base of the target using the best means available and directs the gunner to depress the muzzle of the machine gun the number of mils measured. The machine gun should now be laid to hit the target.